This shot shows the old generator building for the Peninsula Paper Company of Ypsilanti, Michigan. The company closed years ago and the factory was demolished to make way for some apartments. I shot this shot of the old hydroelectric generator building from the site of the old paper factory. It was late in the day and I tried to get to this location before the sun set. I used my Photographers Ephemeris application to check out the sun angle and I knew that it would be shining on the build and I thought the evening light might look good on the building. The one downside with this sun position and time of year is the reddish color of the building tends to make the building blend in with the trees. Later in the year the sun might not be in such a nice position, but the green of the trees would help separate the building from the background. I went through several steps to create the final image. The image started out as a wide angle shot, but I decided I wanted to focus more on the building. I also shot this as a 7 shot HDR, but after I processed the brackets in Photomatix I wasn’t thrilled with the result. After some experimentation I decided to use just two of the exposures and ran them through Photomatix to blend them. I then took the image into Photoshop. The first thing I did was use Color Efex Pro 4 to bring out some additional details. I used a ‘recipe’ that I created which uses the Tonal Contrast, Detail Extractor and Reflect Efex filters. The net result created a somewhat glassy look to the calm water and more details everywhere. I thought image at this point was too colorful. The sunlit portions of the image looked good, but the water had a funky blue tone which just didn’t look right. I thought I might experiment with a black and white conversion, so I used Silver Efex Pro 2 to create an image based on one of the ‘antique’ presets. I adjusted the preset to make the grain less obvious, removed the borders and made some other adjustments. It looked nice, but I decided I wanted to have a bit of color so I reduced the opacity to let some color flow through. The last thing I did was to apply a Topaz Simplify filter. This created a painterly look to the entire image. I blocked out the effect on the trees and building using a layer mask, and I reduced the effect on the water. I could have stopped at this point but I still wasn’t happy with the color. The building had actually become a little greenish. I played with color balance but couldn’t get anything to look right. I decided to start over. I followed similar steps to create a second version, but I managed to come up with an image where the building looked better, but I didn’t like the look of the water as much. As a final step, I opened both images in Photoshop as layers and had Photoshop line them up. Since they were from the same image there wasn’t a problem getting things to line up. I then masked out the water in one image to let the water show through from the other. I also decided that I didn’t link the wide angle, so I created a square crop to focus more on the building itself. Always interested in hearing your thoughts or questions. Feel free to leave them below. Thanks! Very nice transformation James. Really well composed with great light and reflections. Least I see I wasn’t the only one fighting with some color Cool shot man, I think it looks nice. The building color is great. Wonderful transformation. 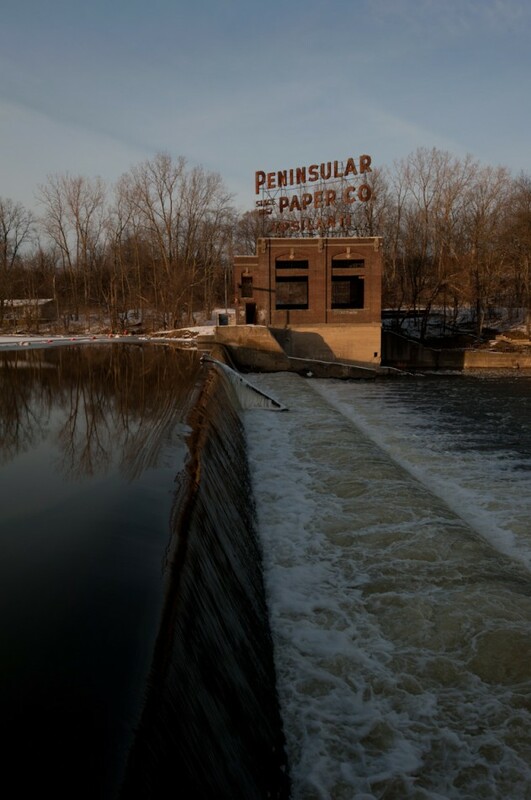 The original shot has very little going for it, excepting the lead-in line of the water falling over the dam. But once processed and suitable cropped this has become a very nice image. All the work you described was well worth it. Nice job, James! Love the warmth in the processed version. 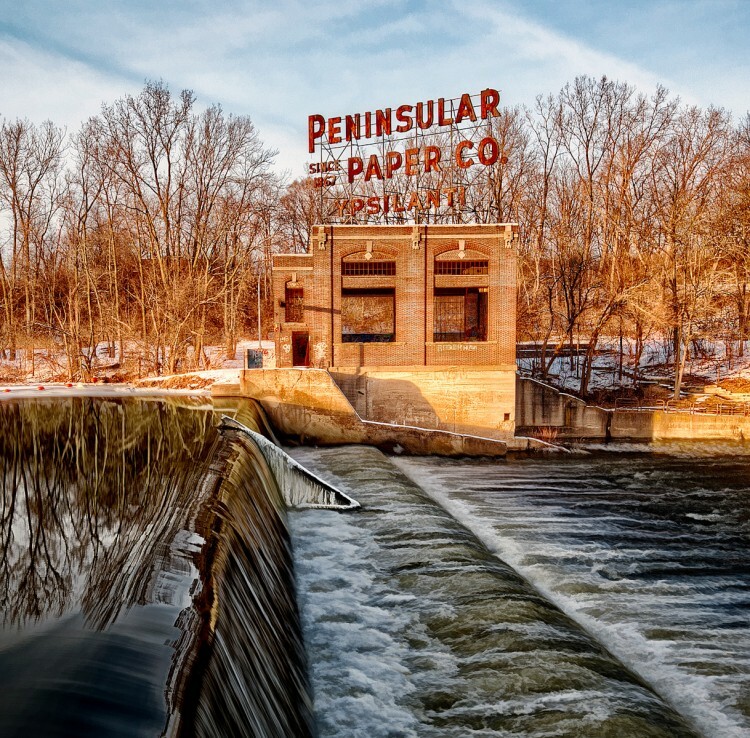 I was born in Ypsi & rode past the paper mill regularly. Your HDR is a real work of art. Excellent.